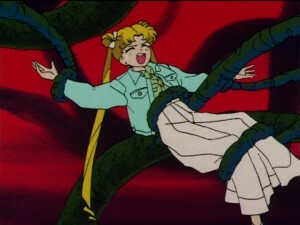 The two latest episodes of Sailor Moon R, episode 57 and 58, were added to Hulu and Neon Alley this morning. This week we get a better look at Natsumi and Seijirou as we build up to the end of the Makaiju story arc. These episodes are in Japanese with English subtitles. 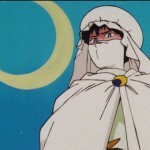 If dubbed episodes are more up your alley be sure to check out episodes 25 through 36 which were added to Hulu’s Sailor Moon dubbed page for a limited time. 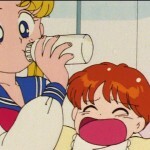 Episode 57, After-School Trouble: Usagi Is a Target, gives us a nice and funny look at the relationship between Natsumi and Usagi who are constantly fighting over Mamoru’s love. Both Usagi and Natsumi get in trouble in class and are punished by their unprofessional and spiteful teacher Haruna. She is upset after her date canceled on her and takes it out on her students. While the students are kept after school she receives a call, which is her date who is able to make plans again. Since this was 1993, the pre cell phone era, this call is taken in the office. She then forgets about her students and leaves! Usagi and Natsumi make a little bet over Mamoru, as if such a thing was binding, over who will finish their assignment first. 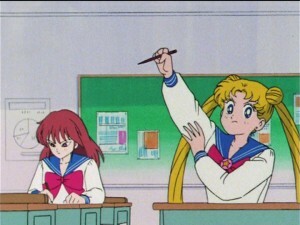 Natsumi ends up with a pencil in the nose but then drains Usagi’s energy so it’s all even. Meanwhile we learn that Ail is not really capable of choosing a Cardian without An. His Cardian won’t listen to him, attacks a bunch of ducks and generally makes a mess for him. Ultimately Usagi and Natsumi get along quite well despite the injuries and we get to see a kinder side to Natsumi than we have in the past. Episode 58, Disconnecting Love: the Raging Makai Tree, is where things really start to come together. In this episode we see some interesting things. 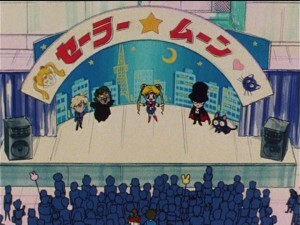 When Usagi, Umino and Naru go to a Sailor Moon show we can see Jadeite, Morga, Sailor Moon, Tuxedo Mask and Luna recreated in large headed costumes. I suppose it makes sense that the public would have this knowledge. Morga was present in a jewellery store full of shoppers in the first episode. 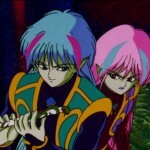 Jadeite, despite his many convincing disguises, chose to appear as a large hologram over the city threatening to set it on fire in his final episode. Usagi and her friends head over to visit Natsumi and Seijirou, which leads nosy Usagi to poke around in their secret room which is actually a massive open area housing the Makaiju, Ail and An’s evil energy sucking tree. Or is it? One wonders how many units in this apartment building were cleared out to make room for this humungous tree, or if this room is bigger on the inside like a bag of holding. After bringing back a piece of the tree and having Artemis nearly killed touching it, Usagi knows something is up and must confront Natsumi and Seijirou. She conveniently meets Mamoru on the way so they all have a nice time before Usagi is fed to the Cardian and tree, causing the Makaiju to freak out and wreck up the building. To be continued! Next week is the epic conclusion to the Makaiju story arc as well as the first appearance of Chibiusa. Support the site by buying these episodes of Amazon Instant or buying the DVD or Blu-Ray sets of season 1 part 1 and 2. 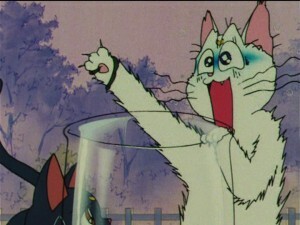 This entry was posted in Sailor Moon Anime (1992) and tagged Ail, An, Artemis, Haruna Sakurada, Jadeite, Luna, Makaiju, Morga, Sailor Moon, Sailor Moon R, Sailor Moon R episode 57 - After-School Trouble: Usagi Is a Target, Sailor Moon R episode 58 - Disconnecting Love: the Raging Makai Tree, Tuxedo Mask by Adam. Bookmark the permalink.